Feeling... accomplished. I had three grants due this week and I got all of them submitted and got a decent jump start on another one due next week! Reading... "Havana Real" by Yoeni Sanchez. I'm really disappointed by this book. I thought it was a biography about Yoeni's life in Cuba, but instead, it's just a translation of her blog posts from 2007 to 2010. I've only recently started reading Sanchez's blog so I'll keep reading but the description of this book was highly misleading. Watching... "The Martian." The Pilot and I watched it last night. I loved it! I thought it was just as good as the book, but better in some ways. In the book, Mark Watney is pretty sarcastic. It's humorous, but his approach to being stranded on Mars is pretty much a take-it-in-stride approach. In the movie, there are several very real moments where Matt Damon just shows how lonely/scared/desperate he got at times. I loved it and highly recommend it. Listening to... Noisli. This is my new favorite website! It plays different sounds (wind blowing, water bubbling, leaves rustling) that you can blend. You can set it to "Relaxing" or "Productivity" and it's so helpful! I've been listening to the Productivity mixes when I'm writing grants and it's amazing how much better I can concentrate! Thinking about... so many plans! I'm trying to figure out which film festival to go to to see my sister's documentary (she got into 3! ), and I want to plan a few trips for the start of baseball season! Working on... our apartment still. It's gotten significantly worse before it has gotten better, but I drafted my editorial calendar for this little blog here and one of the things on it is an apartment tour, so HOPEFULLY that will motivate me to get things done. Needing... to get in a run this week. Ugh. Wanting... The Pilot to get his schedule for March. It is impossible for us to make any plans without his schedule. Annoyed... at my second Stitch Fix. Three of the items were almost identical to items that I returned last month and I didn't even want to try anything on. They sent me a necklace that is cute and I'll probably keep it so I don't lose my styling fee, but I'm pretty disappointed. Excited... about finishing my 30 Day Yoga Challenge! Third time's the charm! Hoping... that our first blogger book club is a success! We're reading "The Memory Keeper's Daughter." If you haven't joined in yet, it's not too late! Loving... the ballet! I saw my first ballet on Tuesday night at the Kennedy Center. It was a showcase performed by the New York City Ballet and I loved it! I want to go to the ballet all the time now! Best part? I crossed TWO things off of my 30 Before 30 list on Tuesday by seeing the performance! 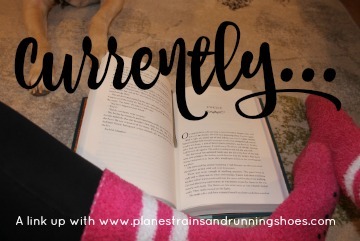 Did you write a 'Currently...' post this week? Don't forget to link up!